Some scams just keep coming back. One persistent fraud starts with a job offer. It ends with the victim losing thousands of dollars. We continue to see these scams because people keep falling for them. But not Ken Caputo, a guy who stayed in touch with Bamboozled after we profiled his battle against New Jersey when the state told him he had to repay $17,000 in unemployment benefits. This time, Caputo reached out to warn our readers of a scam. It started when he received a message on LinkedIn from a relative. After hearing nothing back for two weeks, he said, he sent his relative a message asking when he should expect to hear whether he got the job. Caputo said she didn’t respond, but that same day, he got a text message from a number he didn’t recognize. The texter asked if he had received a package. Caputo said he hadn’t yet, but before long, he got it. Inside was a check for $2,400 and a page of instructions for the job. The assignment? To “evaluate” the nearest MoneyGram and Walmart stores. The first step was to deposit the $2,400 check into his account, noting he should keep $400 for his weekly salary. A redacted copy of the instruction letter received by Ken Caputo. Next, it said, Caputo should go to the nearest Walmart and MoneyGram stores so he could wire the remaining funds. “You will send $1000 to each of the names below from two different outlet around you so that you notice each stores,” the poorly worded instructions said. Caputo would then fill out a form detailing his shopping experience. The recipient of the funds, according to the instructions, had an unusual name. We later saw in a public records search that there is indeed a person of that name in Dallas, but we were unable to track down a phone number. A Facebook message to this person’s profile went unanswered. We did see the person has a hunting and fishing license in Arkansas, is registered to vote there and has an outstanding judgment against him by an apartment complex in Texas. We’re not naming the person here because it’s possible he is the victim of identity theft and not involved in the scam. It’s common for cybercriminals to steal the identity of innocent people, creating fake social media profiles for trickery. A redacted copy of the check sent by the scammers. 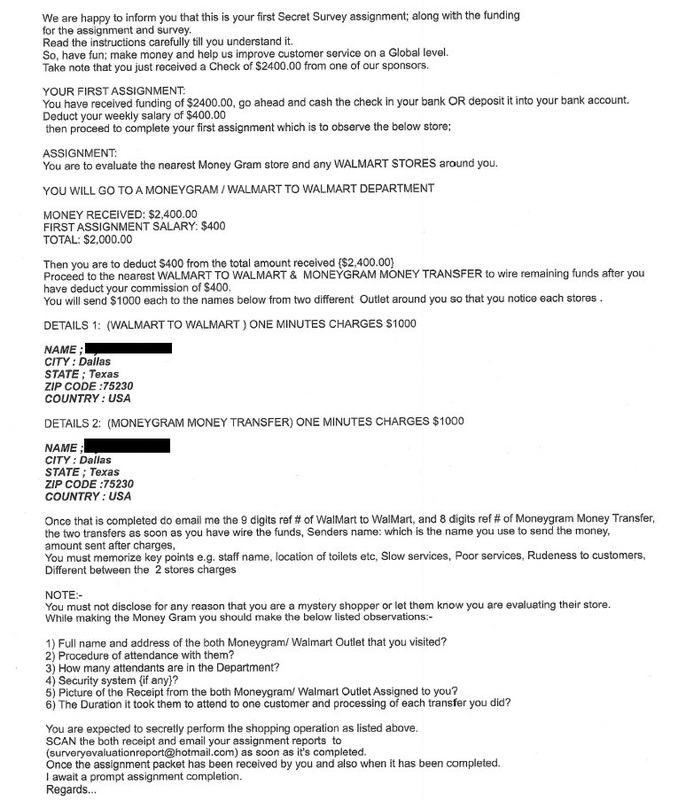 Next, we looked at the check, which was drawn on an account from First Madison Bank & Trust, a real bank in Colbert, Georgia. We contacted the bank to ask it to verify whether this was a real check from its institution. It’s fraudulent in every way, said Eric Johansen, the bank’s vice president and chief financial officer. He said he’s seen many times when a bank’s information is used to create fake checks. He contacted his relative and learned her LinkedIn account had been hacked. He also reported the scam to LinkedIn and to his local police department, which told him to rip up the check. We reached out to LinkedIn about the scam attempt. It wouldn’t say how many complaints it receives, but it said it has measures in place protect members from fraudulent activity. These fake job scams aren’t just found on LinkedIn. You can see them on all social media platforms and in online “help wanted” postings all over the internet. While the “secret shopper” scam is nothing new, there are varieties on the scam. There are others targeting college students, another specifically marking dog walkers and babysitters, and still others promoting different kinds of fake jobs. But they all work the same way. The phony employer sends you a check to cover your pay and the extra money you’ll need to wire or use to buy gift cards. When the employer’s check bounces — and it will bounce — you’ll be on the hook for your bank overdraft and the money you sent out will be gone. The next time you see an offer, think like Ken Caputo: If it looks too good to be true, it probably is. This entry was posted on February 22, 2018. Bookmark the permalink.